OnePlus is gearing up to introduce its next-generation flagship smartphone, the OnePlus 6. 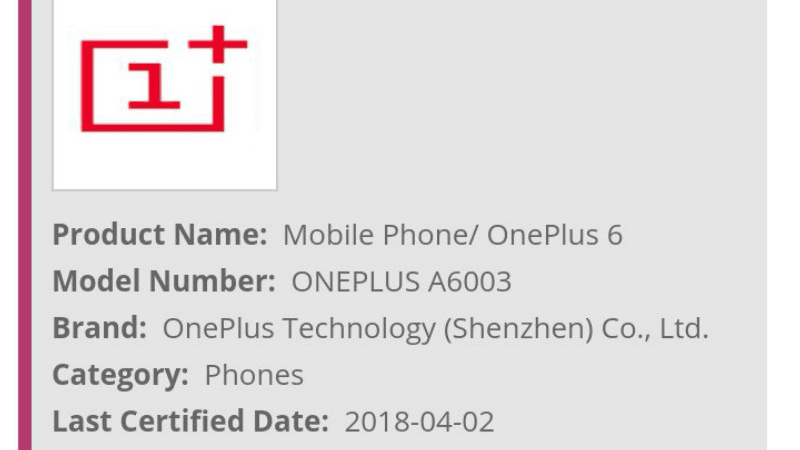 Recently, it was rumoured that the upcoming OnePlus device might not be called as OnePlus 6, but this new Wi-Fi certification has confirmed that the phone will be called as OnePlus 6 and it will carry A6003 model number. At the time of certification, the device was running Android 8.1 Oreo, and it might launch with the same version of Android. The OnePlus 6 will support both 2.4GHz and 5GHz Wi-Fi frequency bands, which is an expected feature. Recently, the company’s co-founder has posted on Weibo that the upcoming OnePlus device may not be called as OnePlus 6, instead, it might be OnePlus 7 or OnePlus 8. 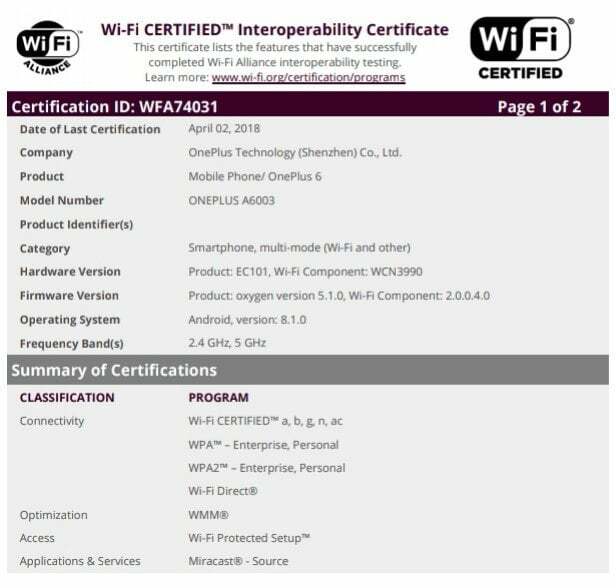 However, this Wi-Fi certification has cleared the air and confirmed that the phone would indeed by monikered as OnePlus 6. That said, with the phone already receiving Wi-Fi certification, it’s an indication that it will be launched sooner than the expected launch time. Another rumour hints that OnePlus is planning to launch the smartphone sometime in the second half of April. The OnePlus 6 is expected to cost a bit more than the OnePlus 5T. In India, the phone is expected to be priced at Rs 34,999 for the base 6GB RAM model, whereas the premium model with 8GB of RAM and 128GB storage could be priced at Rs 39,999. This is an expected thing because with every iteration, OnePlus increased the price of its smartphone. The OnePlus 6 is already confirmed to feature a notched display, like several other smartphones releasing this year. And of course, it will feature top-notch specifications- Snapdragon 845 SoC, up to 8GB of RAM & 256GB of internal storage. The phone is already confirmed to feature dual camera setup to the back, but the configuration details are unknown at the moment. Also, OnePlus is silent about the wireless charging feature on their upcoming device, so if OnePlus doesn’t add that, it will lose out the battle with the Xiaomi Mi Mix 2S in India. It will be interesting to see which manufacturer launches the first Snapdragon 845 SoC smartphone in India. Xiaomi has already launched the Mi Mix 2S in China and is expected to bring it to the Indian market very soon. And the OnePlus 6 is slated for mid-April release. The affordable flagship battle is heating up! 40k camera matters.waterproof is must..hope one plus delivers both..if Samsung could slash s9,+ price to 45k must have been sweetest hot deal.